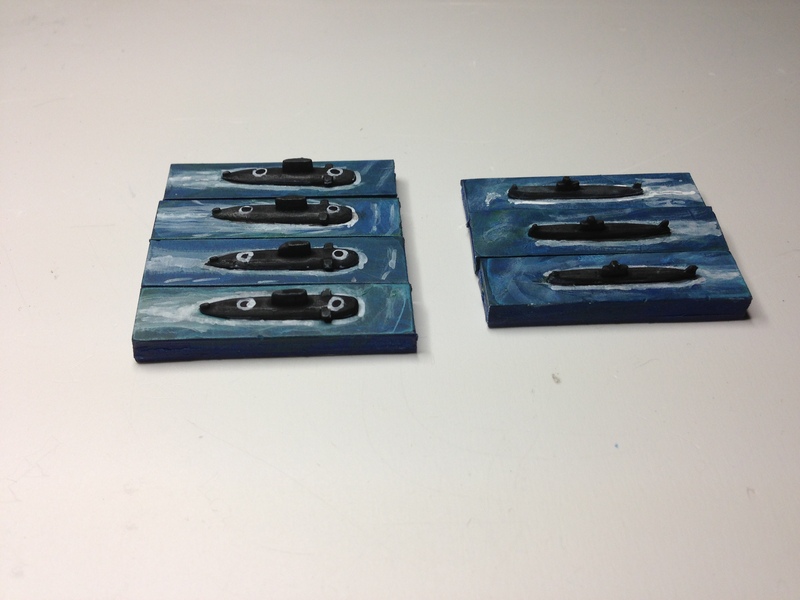 I managed to get some painting time over the weekend and knocked out another three Kilo-class submarines for the Indians and the 3 Han-class submarines for the Chinese. The sea bases were the most time consuming part of the painting progress, after all, how long can it take to paint a 2 cm long model dark grey then wash again in black? I’m not sure I actually like to appearance of the sea bases at the moment but it’s the best I’ve been able to come up with on a flat surface. Whilst I also like what others have done by way of sea bases – see Of Mice and Tiny Men and a Lead Odyssey for some nice textured sea bases texturing has not been working for me so far. I won’t mention my recent failure again but suffice it to say that some point I will need to sit down and try and do a proper job. In the meantime, I guess the two-dimensional hand painted ocean will have to do – at least until I find some Hammered Metal (Coral colour) here in Singapore. The Han-class at the rear for example will need a bit of a touch up, the wake is too white. A bit more of a repaint tonight I expect. At least one of the targets on the Kilo-class also needs a touch-up. Oh well – sometimes it works and sometimes it don’t! Also under-way at the moment are some aircraft – Harriers, Il-38s and Ka-25s (filling in for Ka-27s) of the Indian navy. I am not sure with the aircraft whether I will just leave them on their metal bases as they come or mount them on 1 cm x 1 cm (or 2 x 2) plastic squares to bring them up to ship height. Some prototyping of that tonight as well I guess. And yes, apart from finishing the Kilo-class submarines for the Indians and the Ming-class for the Chinese tonight I will also start on some of the surface vessels – INS Vikrant and the three Rajputs are the rest of tonight’s painting target. Mind you, just looking at the dark blue base (well, Citadel’s Regal Blue which I suppose is close to the old Ultramarine Blue) there is a lot to be said for the plain blue base with just a white wake. 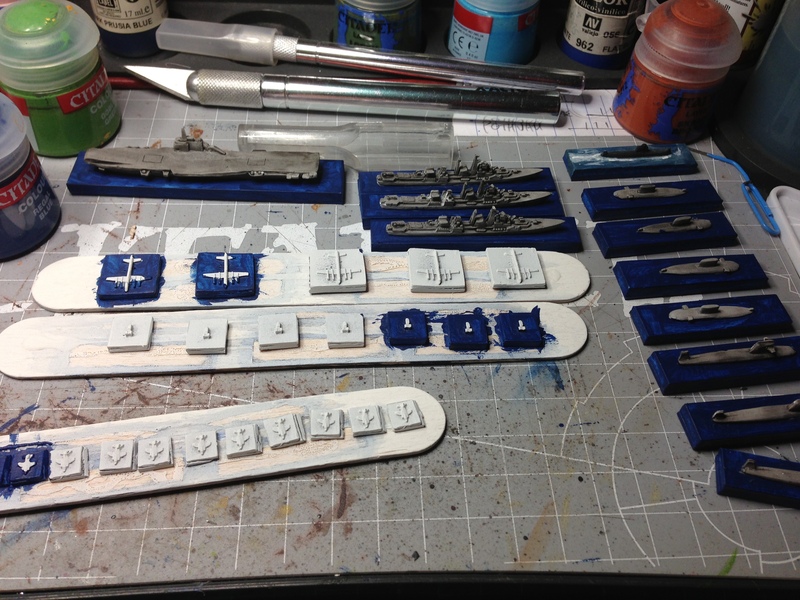 Me too re the basing – I reckon if I can get the %&)£@#~%$ sea-bases sorted tonight, I could finish the fleets within the next two weeks – I have 15mm ACW, 2mm Aeronef terrain and two 15mm DBA armies calling for my attention!